Hi Folks Brian here, after a little bit of a gap. Yes, Brian Talks has been a little bit quiet and I think there was probably a good reason to be a little bit quiet around the election time. Some of us were very disappointed with the result, but this is what we're stuck with and we have to make the best of it. We will be campaigning as before, except probably a little stronger against the idea that wild animals are vermin and dangerous and disgusting and should be eliminated from our country. It's very interesting, talking about the election, that a lot of the analysts are now saying that actually what won that election was propaganda and basically the rules, the tricks of propaganda, are very old and very well known. Basically, you try to scare people and it was wonderfully well orchestrated in the newspapers - this business of "Oh my God, we might get people running around in kilts running our country. We might get Scotsmen in parliament. Terrible thing that would be so you'd better not vote for the Labour party". And I remember thinking, no one's gonna fall for that, but they did. Amazingly they did. 'Course you could point out to them we already have Scotsmen in the Houses of Parliament at that the time, but of course that wouldn't have helped, you know. The propaganda was already out there. It was massively promulgated by the Tory Press and I think there's a good case for an investigation into how truthful those stores were in the weeks leading up to the election. I think we have some kind of right to expect the newspapers to tell the truth. There's a number of things you can point at, which were completely fabricated stories, and I don't believe that newspapers should have the right to lie to us any more than we have the right as people to lie to each other. Taking it a stage further now, we have a new government, but the propaganda machine has already swung into action very noticeable, so you'll notice stories in the Telegraph and the Mail preparing us, trying to soften us up for what this government would like to do. What they would like to do is legalise blood sports, bring back fox hunting - who knows where that will lead - and ripping up the Human Rights Act. If you've got a minute, have a look at the Human Rights Act and see if there's anything in there which you would like to get rid of. It's things like, you know, you're not allowed to hold people as slaves, you're not allowed to be.... well just have a look and see what you think and see if you'd rather have a Human Rights Act, which was based on what was hammered out by the European Convention on Human Rights just after the war, or whether you'd rather have Theresa May's morality pushed on us. It's a matter of control, I guess. So, returning to fox hunting the papers are already on it and they're already trying to prepare us for this idea that foxes are really disgusting creatures. I mean, they do terrible things. They'll eat your baby, they'll eat your cat, they'll eat your dog, they'll spread disease. 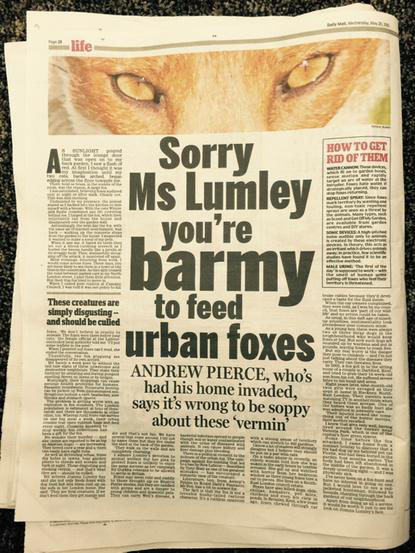 Well, folks, it's all disgusting, unfounded propaganda and you get an article like this in the Daily Mail, which you can have a look at in a minute [see below], and it says "Sorry Ms. Lumley you're barmy to feed the foxes". Well, it was carefully set up and you could see how that was done. 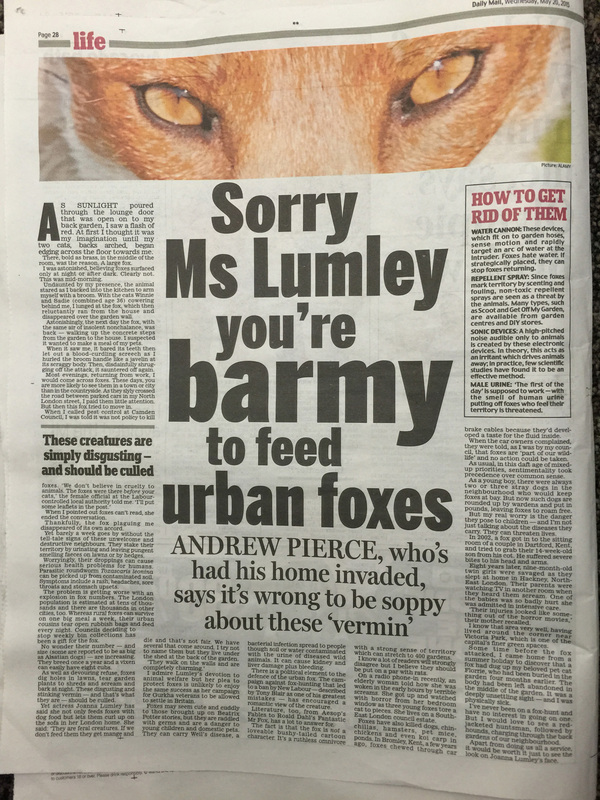 "Let's print a story about Joanna Lumley being nice about foxes, and then we can all say how terrible it is because they're such disgusting creatures." And they're talking here about foxes eating babies. Now let me tell you, maybe if you do it on a yearly basis, there might be one attack from a fox on a baby, which is probably brought about by some negligence on he part of somebody leaving a baby with some smell on them so the fox can mistake them for something else. It may be - a lot of people have been saying that even those attacks might have been something else, like the family dog, or whatever, but if we allow for the fact that maybe there's a fox attack, something a little bit less than one per year in Britain, the number of children admitted to hospital because of bites from dogs was in the region of 600 last year, and it's often been greater than that. We're talking about babies being attacked by the family dog or someone else's dog. A few babies are admitted to the hospital because of scratches due to cats and squirrels, and whatever; even some from budgerigars. But do you know what the worst attacker on children is? Way out ahead is the human being. There are more cases on children and physical abuse, and I'm talking mental abuse, than any other creature that you can name. So the idea that the fox is some disgusting creature because of one possible attack per year is absolutely pernicious - is absolutely falsifying the evidence. There is no reason to brand all foxes as disgusting because of something like that then there is any reason to brand all human beings as bad because of similar evidence. This stuff is pure disgusting, dirty, filthy propaganda and it will go on, the reason being they want to win the fox battle. This is in direct collusion with our government, who have long wanted to legalise the old blood sports that the Hunting Act got rid of, or at least partly got rid of because there are plenty people still breaking the law. This is what they wanna do. They'll persuade us that all wild animals are actually disgusting and will hurt us, and so they can just be eliminated. We can eliminate badgers in the same way because whether or not they're carrying some disease like Bovine TB, and they're probably not, we can still eradicate them because they're just vermin. They're just wild animals. Who cares about a wild animal? Animals like foxes and badgers have been in this country longer than we have. I would put it to you that they have just as much right to decent treatment as we have as human beings. Let's not be misled by the disgusting propaganda, which will continue to come out. There'll be stuff about the National Health as well. They'll be saying that the National Health is disgusting and inadequate and terrible so they can soften us up for the fact that they're gonna dismantle the National Health, and they've already started. There'll be stuff about all number of things that they wanna do, particularly Human Rights. They'll be trying to persuade us that really we should be independent of Europe and we shouldn't take any notice of Europe as regards Human Rights. They will tear up our right to the Human Rights Act - if we let them. And this stuff might even be in the Queen's Speech, that's what they want, so it will be fascinating to see what the Queen will be saying: "Oh we're about to being back fox hunting this year and all those barbaric, old, cruel, sadistic sports, and we're probably going to tear up the Human Rights Act". Let's have a look at the Queen's Speech and see how much the cruelty side of the Tory party represented by Cameron and Theresa May, etc, let's see how well they manage to persuade the Queen to tell us these wonderful bits of news. BRIAN TALKS #12 - Joanna Lumley is not Barmy, sadistic blood sports, and the "Queen's Speech"
Why Joanna Lumley is not Barmy. And why the Queen of England may be welcoming the return of sadistic blood sports and tearing up the Human Rights Act in her imminent 'Queen’s Speech’. Are Britain’s foxes really dangerous, vicious, plague-ridden terrorists? Will they eat your baby, your cat, your dog ?! The Daily Mail and the Daily Telegraph would have you believe they are. In fact, foxes are actually guilty of little more than occasionally rescuing food from dustbins with ill-fitting lids. And for that, there are some humans who would pass a death sentence on them. In the list of creatures who most often hurt man, baby, or beast, they are well down the list - behind Dogs, Cats, and Humans. But foxes are currently the victims of a smear campaign in the infamous propaganda-ridden Tory Press. Why ? We have to look at the hidden agenda in these attempts to vilify these magnificent creatures, our British wildlife heritage. It’s a dirty business, with its roots firmly planted in Westminster. The figures on dog attacks are even worse than I’ve indicated in this video. The number of children hospitalised by dog attacks last year was 1,100. The total number of dog attacks which hospitalised adults last year was 9,000 … yes, NINE THOUSAND. And in that number, there were 5 fatalities. There were NO hospitalisations due to foxes. So how dishonest, how mischievous, how evil is this campaign to vilify foxes? Well, an awareness that the Murdoch/Tory Press is virtually all about pro-Government propaganda is essential if we are going to have a chance of getting a fair deal for children and animals (and the poor, and the sick and disabled) in the next 5 years. But if you’re a rich ‘aspirational’ entrepreneur, ‘creating jobs' and accidentally making yourself even richer in the process, don’t worry, Mr. Cameron will make sure nothing bad happens to you!